The Beatitudes present a beautiful collection of promises from Jesus himself to those who love God and are called according to His purpose. You can read them all in Matthew chapter 5 for your spiritual enlightenment and encouragement. I’d like to focus on one of these promises to those who make peace between people. What is a peacemaker? It’s one who makes peace between two opposing parties. Have you ever settled a dispute between warring factions in your own household, say between a parent and a child? Then you are a peacemaker. Have you ever calmed a situation between two people that might have errupted into something more serious — or that might have ended in a break in healthy relationship between them? Then you are a peacemaker. Those who make peace “shall be called the children of God.” It takes a selfless person to make peace between others who are not at peace. Why would anyone want to get involved in the first place? The peacemaker knows that any state of non-peace between two parties is not good. If peace can be achieved then it’s definitely worth the effort so long as the truth is not compromised in the process. However the intervention that a peacemaker performs doesn’t have to be between two parties. Let’s look at the antonyms (opposites) of peace to get a better idea of what Jesus is talking about. Wow! That’s quite a list, isn’t it? All these things indicate a state of un-peace that needs to be addressed. Many of these can involve only one person. How many people have you met this week who are or were either worried, upset, frustrated, agitated or in distress? I bet at least one; probably man. What can you do to promote peace in such situations? Let’s go to God’s Word, the Bible, and see what God has to say about peace. Psalm 18:32-36 It is God who arms me with strength and makes my way perfect. He makes my feet like the feet of a deer; he enables me to stand on the heights. He trains my hands for battle; my arms can bend a bow of bronze. You give me your shield of victory, and your right hand sustains me; you stoop down to make me great. You broaden the path beneath me, so that my ankles do not turn. II Thessalonians 2:16,17 May our Lord Jesus Christ himself and God our Father, who loved us and by his grace gave us eternal encouragement and good hope, encourage your hearts and strengthen you in every good deed and word. Romans 5: 1 Therefore, since we have been made right in God’s sight by faith, we have peace with God because of what Jesus Christ our Lord has done for us. Romans 15:13 May the God of hope fill you all with joy and peace in believing, so that by the power of the Holy Spirit you may abound in hope. Galatians 4:16-18 So we do not lose heart. Though our outer self is wasting away, our inner self is being renewed day by day. For this light momentary affliction is preparing for us an eternal weight of glory beyond all comparison, as we look not to the things that are seen but to the things that are unseen. For the things that are seen are transient, but the things that are unseen are eternal. II Thessalonians 3:16 May the Lord of peace himself give you peace at all times and in every way. The Lord be with all of you. Realizing what God has done for us already through Christ, and what He will do for us in the future is the basis of our peace in this world. No matter what we face, we can overcome it in Christ. Christ is our peace. Believe God’s Word and receive the peace He has. We do this by renewing our minds to God’s Word. Romans 12:2 And be not conformed to this world: but be transformed by the renewing of your mind, that you may prove what is that good, and acceptable, and perfect, will of God. Renewing our mind leads to us “walking by the spirit” God gave us when we were born from above (born again). Walking by the spirit leads to life and peace. Walking by the spirit also produces fruit of the spirit in our lives and guess what — peace is a fruit of the spirit! Galatians 5:22-26 But the fruit of the Spirit is love, joy, peace, patience, kindness, goodness, faithfulness, gentleness, self control. Against such there is no law. And those who are Christ’s have crucified the flesh with its passions and desires. If we all live in the Spirit, let us also walk in the Spirit. Let us not become conceited, provoking one another, envying one another. There are many more verses you can consider, but I’ve presented a number that might help you to be a peacemaker in other people’s lives. Without God there is no peace. Without submitting to God’s Word and living life the way God wants us to live it results in all those antonyms of peace we looked at earlier. And when we are walking by the spirit, doing the things of God in this world, we can often be confronted with situations that steal our peace and rob us of our joy. Do not let that happen. Know that the trials and tribulations of this present world are not worthy to be compared with the glory that God shall reveal in us, the children of God. Let these truths from God’s Word sink into your heart and mind. Choose peace and be a peacemaker in other’s lives and between opposing parties. 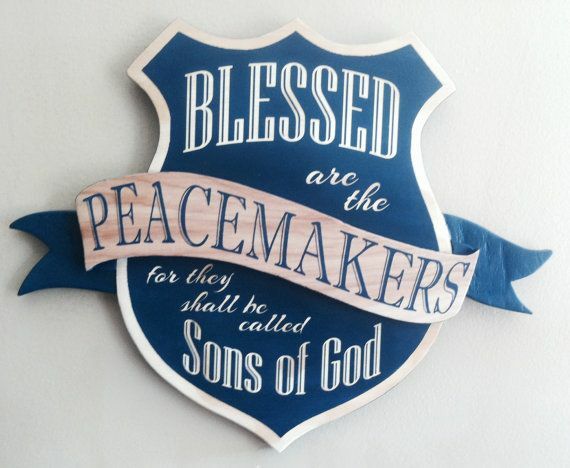 Blessed are the peacemakers for they shall be called the children of God. Peace to you and grace from God our Father and from our Lord Jesus Christ.